Red Cathedral is a small peak, with some steep red cliffs, located in the Black Mountains of Death Valley National Park, not far from Furnace Creek. The shortest access is via the parking lot for Zabriskie Point, but Red Cathedral sees far fewer visitors that Zabriskie Point itself. It is a great location to enjoy a sunrise or sunset. After driving from Boise to Death Valley, and a nice hike up 20 Mule Team Peak, I was hoping to reach the summit of Red Cathedral in time to watch the sunset. But as I left the Zabriskie Point parking lot, and began making my way along the ridge to Red Cathedral, I could tell I was a little behind schedule for the best lighting. There is a good use trail that leaves the parking lot and follows the ridge to Red Cathedral. It was a fun little hike, and I enjoyed the views of the sun sinking behind the Panamint Range to the west. I stayed on the summit for a little while enjoying the views, including looking back on numerous folks at Zabriskie Point. Soon enough it was time to head down, and I got to the car just before dark. Round trip was just over 2 miles, 400’ elevation gain, in 45 minutes. Map of the route, just over 2 miles and 400' gain round trip. Red Cathedral from the trailhead. Looking back on the trail up Red Cathedral. Summit view looking east at Zabriskie Point. Sunset over the northern Panamint Range. 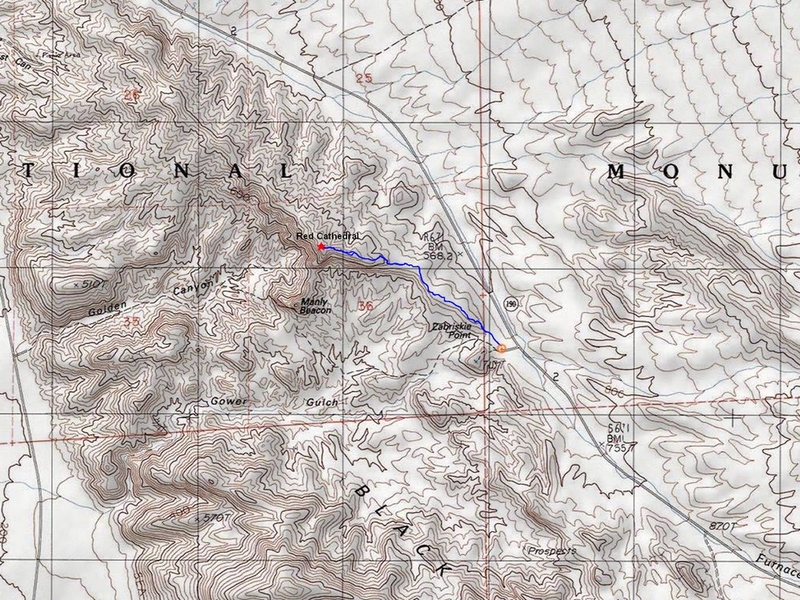 Map of the route, just over 2 miles and 400' gain round trip.Red Cathedral from the trailhead.Sun setting above Red Cathedral.Looking back on the trail up Red Cathedral.Summit view looking east at Zabriskie Point.Sunset over the northern Panamint Range.